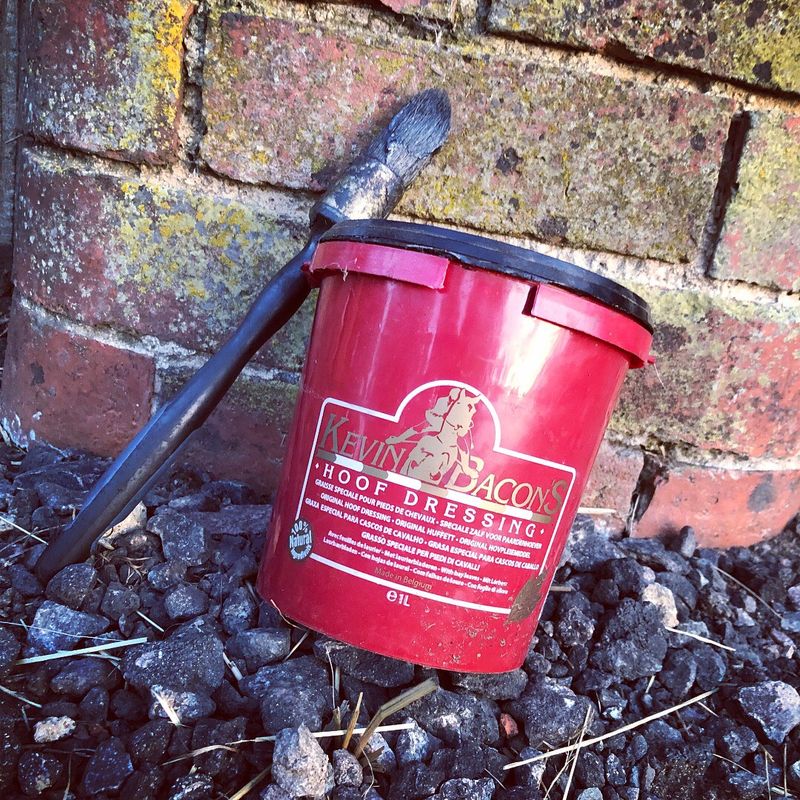 Today I am writing about a product I have used for as long as I can remember, an essential I would be lost without, an unsung hero, that undeservedly has never made it to the bright lights of Gee Gee and Me; my Kevin Bacon Hoof Dressing! It was a general conversation with my farrier that made me realise I had to write this post, he asked if I had seen the Kevin Bacon Facebook post sharing the hoof clipping? At Kevin Bacon HQ they took three fresh hoof cuttings to demonstrate the importance of hydrating hooves and the experiment went like this.. They were left in the sun for one hour and the results show how much specimen 1 dried and shrivelled up from the lack of moisture. 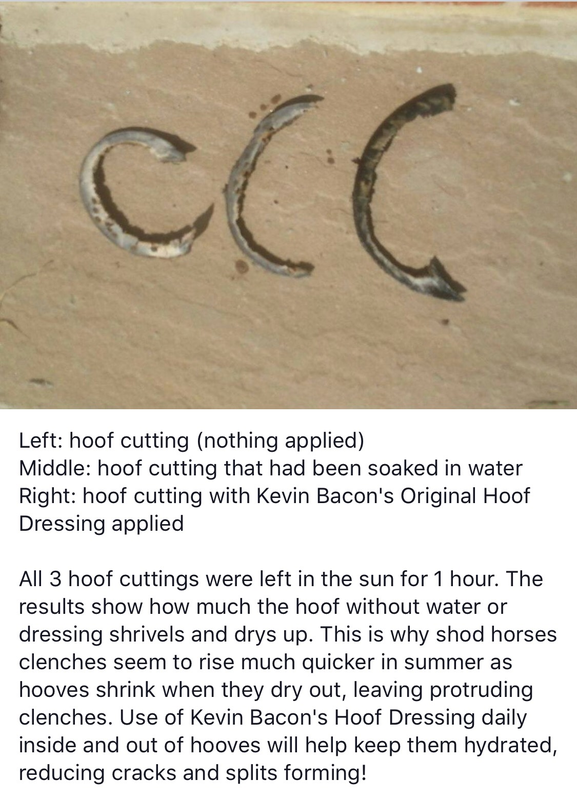 The experts at Kevin Bacon HQ went on to explain this is why a shod horses clenches seem to rise much quicker in summer, as the hooves shrink when they dry out, leaving protruding clenches. 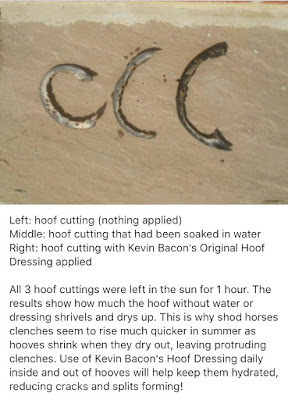 The use of Kevin Bacon's Hoof Dressing daily on both the inside and outside of hooves will help to keep them hydrated, reducing cracks, splits and lost shoes. Both gee-gee's in my life have their own pot and I apply it daily. When Bridge came home a stock of Kevin Bacon's Hoof Dressing was on my 'essential' list for him and it is something Oscar is never without. Because both boys have dark feet, I choose the Ash over the Original, the difference being one is black, Ash and the other clear, Original. To create the colour, the magic ingredient is a natural burnt ash giving the balm a dark appearance. This avoids the use of tar and the risk of hooves drying out. 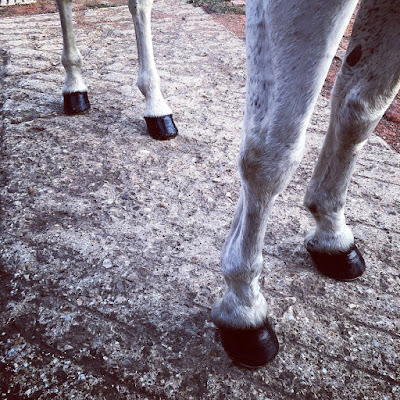 I believe it is thanks to my great farrier and Kevin Bacon that Oscar' feet are as strong and healthy all year around and I don't often say this but, if you don't have it, buy it.